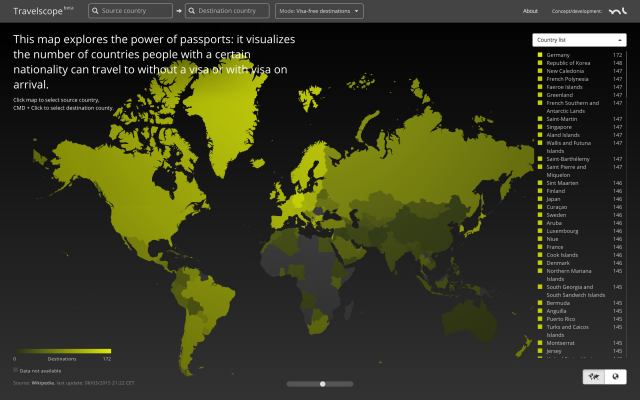 This interactive experiment aims to cast some light on these structures and make it easy to find out which countries an individual of a certain nationality can travel to without a visa or with visa on arrival. I wanted to create an intuitive and instant way to find out how many countries a certain national can travel to without a visa or with visa on arrival – and which nationals can enter a certain country without a visa. The web application also features a responsive design and directly works on any iOS device (iPhone/iPad) running iOS 8 or newer and on recent Android versions. The interactive map is programmed using D3.js and Three.js; the visa data are pulled from Wikipedia in regular intervals.